1. Decor Steals is one of my favorites. They have a different deal each day and some ongoing deals, too. You have to act fast because the better the deal, the sooner it might disappear. There are limited quantities available. They start a new deal at 10AM est every day. Shipping is always just $5. Some of my favorite household items came from Decor Steals. If you sign up for their daily emails via my link we each get $5 off the first time you make a purchase. Win-win! 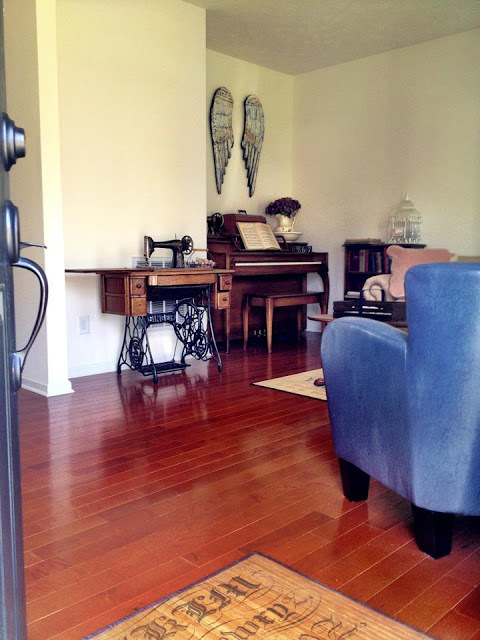 In the photo beow there are several items from Decor Steals: The angel wings, the bamboo mat at the bottom of the photo, the bamboo mat up towards the piano, and the wooden basket on the table. 2. Antique Farm House. They are a sister site to Decor Steals, but I haven't seen the companies do anything together besides post buttons for each other. Antique Farm House brings collections of items andI sells them for a couple of weeks or until they are sold out. You never know what kind of collections you will see or what will be in them. I got some awesome remote-controlled pillar candles from them for a great price. Usually when you order from them you get something which exceeds your expectations. They always undersell. It's a source of great deals and unique finds. Everything isn't farm style, don't worry. 3. Wayfair. I have so much stuff from Wayfair, that if I listed it all you'd wonder if I ever bought anything anywhere else. I found my flatware from them, I bought my husband an industrial size popcorn machine from them, I was able to find paintable beadboard wallpaper through them. I even have a wine refrigerator I just got from them in a giveaway they did! I mean it - I have a label maker, a few open stock farberware pieces, coffee maker, sewing machine, giant wood cutting boards, desk chairs, quite a few pieces of Le Creuset, puppy potty pads, memory foam mattress toppers, shelving units - you get the idea, I'm sure. They carry everything at Wayfair. They are great about shipping; it is usually free and it is fast. Plus, they wrap everything well. I had bubble wrap for miles. Right now I am considering buying a mattress from them. I'm a little nervous about a mattress, but they have been great for everything else. We'll see. 4. Save On Crafts. I can't even begin to scratch the surface with them. Want decorating things for a wedding? Oh, you got it, dude! They are a great source for that German Glass Glitter everyone charges a fortune for around the DIY blogosphere. Seriously, the clear for $6 a pound and the silver or gold for $16 a pound. Compare it to the about $20 an ounce lots of re-sellers want for it and you can thank me later. They have wire baskets, bottles, lights, fairy lights, chalkboards, apothecary jars, boxes, buckets - forget me trying to list it. If it is home decor or home decor supplies or anything you need for a party they probably have it. Their prices are the best. Warning: You may lose hours the first time you visit the site. 5. Peaceful Acres Lavender Farm. They sell you the stuff direct from the source. They offer free shipping on orders over $40. I can't promise the best prices in the known universe, I haven't done enough research for that kind of vow. I can tell you I did enough research to feel good recommending their prices. Lavender is another item where price gouging exists at little shops. If I am going to spend $40 on lavender, I'd like to get a generous supply. 6. Decor Superstore. If you are a DIY'er you will be in heaven! Crown molding, ceiling medallions, tin ceiling tiles, corbels, baseboards, door trim, window trim, chair rail, water features, rosettes, etc. They have it and they have good prices. They even have outdoor statues. 7. Amazon Prime. Really. For about $80 a year we get a Netflix type subscription AND free two day shipping on most stuff we buy on Amazon. We buy a lot of stuff from Amazon. If you buy from them often it's a no-brainer. Why pay more for slower shipping? Add the free video on demand subscription and drop Netflix and you save more than the Netflix streaming costs per year anyway. Do you have some go-to online shopping sites to recommend? I would love to hear about where you get your deals. 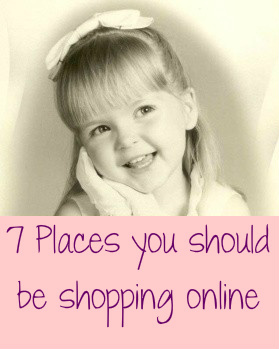 The last thing I need is more places to shop online!! Great suggestions though. You are da bomb! I have been looking for a place that sold something that resembled coffered ceilings for weeks to no avail. Just clicked on your Decor Superstore link and they have everything I want. Oh, boy, is my husband going to be mad at you...LOL!! Great resources! I use Amazon Prime, but I need to check out the rest! Thank you!! !